"This is your dream! You have to go for it, do you hear me…?" Vue Cinemas has unveiled an official trailer for an indie stop-motion animated film titled Strike, made by a small studio in the UK and being released next month. As pointed out on Twitter, "the title refers to both soccer and mining - you don't get much more British than that." Strike is about a young mole from the town of Diggington who dreams of becoming a soccer player (a "footballer" in the UK) but his big challenge is telling his father. "How can he tell his dad he does not want to work at the mine, it will break his heart… This mole with a goal… should he tell?" Strike stars the voices of Lizzie Waterworth, Ken Stott, Alex Kelly, Naomi McDonald, Tom Turner, Dave Mounfield, and Beth Chalmers. This looks cute, and it's great to see another stop-motion film out there. A young mole named Mungo Morrison must try to achieve his impossible dream of becoming a footballer in order to save his hometown Diggington and its gold mine from a greedy supervillain known only as 'The Boss'. 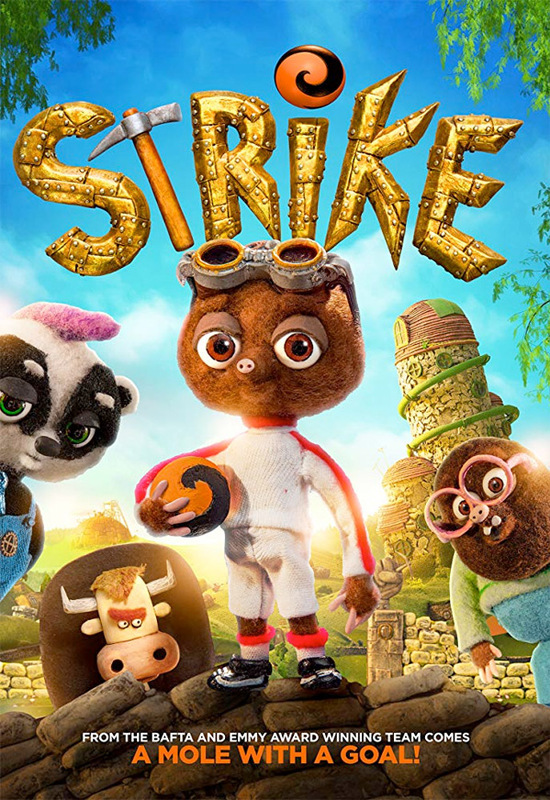 Strike, also known as Mango for release in France, is directed by British animation filmmaker Trevor Hardy, making his big feature directorial debut after directing a number of stop-motion animated short films previously. The screenplay is written by Neil James and Mark Holloway. It's made by animation studio Gigglefish based in the town of Lewes, England. This film first premiered at the Carrefour du Cinéma d'Animation festival last year. Gigglefish & Hardy's Strike will be released in Vue Cinemas exclusively in the UK starting on May 11th next month. No release date is set for the US yet. Who's interested in seeing this?